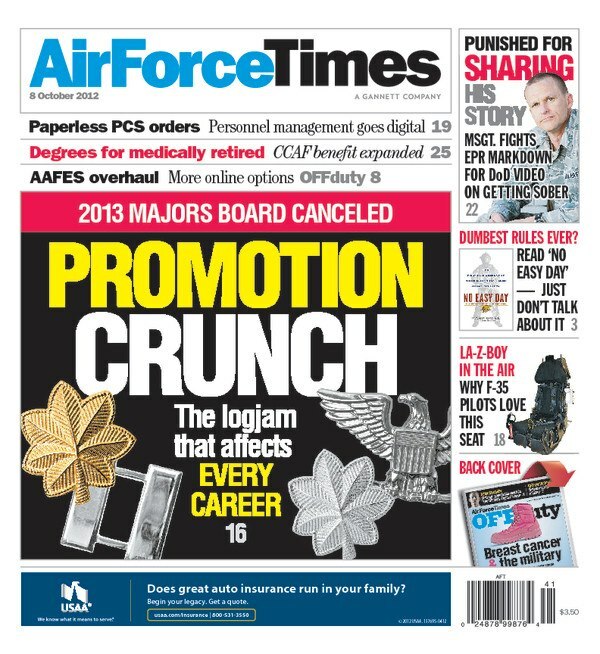 The Air Force has effectively canceled the 2013 promotion board for line majors, directly affecting 2,500 line captains but also signaling a problem facing the entire Air Force. Too few lieutenant and full bird colonels are retiring, and that has created a logjam that affects all officers. Read this week’s Air Force Times to find out how you are affected. In other news, Master Sgt. Russell Granger sought help for alcohol abuse, turning his life around. But years later, his involvement with Alcoholics Anonymous was used against him on a performance review, on which he scored a four out of five. Also, the Air Force is testing a new system that would allow airmen to submit their permanent change-of-station documentation online. That means you wouldn’t have to go to your base military personnel section with a stack of paperwork. And about 750 wounded airmen who have retired or separated can now complete their Community College of the Air Force associate’s degree. Previously, airmen could not complete their degrees if they left the service, no matter how many credits they had. The issue is on newsstands now. To read it immediately, subscribe to our digital edition. Sound off: Best and worst bases in the Air Force? Copyright © Flightlines. All Rights Reserved.